Man Of Steel was a film of promise. The visuals of Snyder with the story telling prowess of Goyer/Nolan seemed like a slam dunk, but somewhere along the way the ball got dropped. In my opinion the casting of big name actors in supporting roles became a problem, the finished film has scenes that seem designed purely to give these star names a defining moment. Another element that felt a bit forced was the Christian allegory with Kal-El no longer being special because he's from another planet, but now being special even amongst his own people as the first natural born Kryptonian in an age. In this cut Kryptonians have children by doing the nasty, just like the rest of us. No genesis chamber. Hopefully this cleans up the narrative, strengthens the performances of all the actors, and makes the ride more fun for the audience. Q2 for his advice and encouragement. L8wtr (via Q2) for the technical advice regarding Macs. Who knows if I'm doing it right, but thanks to you both I'm getting it done. I used FCPX to edit. Started in November and finished in early February. Since then I have been trying to figure out how to make it available, had a few issues with FCPX and the 5.1 soundtrack when exporting, but found some tricks around the problem. - The politicking and destruction of Krypton has been pretty much removed. As much as I liked the science fiction/fantasy elements it showed, it was not needed, everything in it is described by Jor-El later. The film starts with the birth of Kal-El, his parents putting him into his ship, Krypton exploding and the journey to Earth, all to music from the MOS soundtrack (Flight). Clark's story on earth is chronological but as a kid I've only included the classroom scene and the bus crash (and subsequent talks with Pa Kent). Pa Kent's 'maybe' is gone. The garage bully scene is gone, it was a nice scene but I wanted to keep the transition from Pa Kent telling Clark to find out his origins to... Clark as an adult in the truck stop hearing about an anomaly. - The oil rig scene is gone. Again, as nice as it was, it served no purpose. - Jor-El's chat with Clark is cut slightly. All references to Kryptonians being genetically birthed are removed, as is any reference to Clark being the 'first natural birth in millennia'. Also some of the more ernest nuggets from Jor-El are trimmed. - The most pointless death in cinema is removed, now Clark finds Lois at his father's grave and talks her into dropping the story, no flashback. Pa Kent died, the how is irrelevant. - Visit to the church is cut. The Christ metaphor has been minimised as much as possible. - After his chat with Zod in the dreamscape (What the hell is that supposed to be? A sixth dimension of exposition? Anyone?) he awakes alone strapped to the table, further chat with Zod about his father is removed. - Fight in Smallville has some minor tweaks, the first bullet strafe no longer has Superman jumping out of the way into a building, Faora-UI and Colonel Hardy no longer flirt. - Indian Ocean World Engine scene is now in two parts, rather than many. - The struggles of Jenny trapped in concrete is removed completely. - Zod now goes in search of Kal-El rather than for the genesis chamber. All the scenes involving the scout ship have been removed. - Once again, Faora-UI and Colonel Hardy don't flirt with each other before Hardy sends them into a dive. - Lois falls from the aircraft and is caught by Superman returning from Indian Ocean (no scout ship, so no Zod trying to shoot them down). - Kissing scene is dialogue free and more of a stolen moment than an awkward 'will you be my girlfriend' thing. - Zod and Superman fight is cut down in places. - Zod's eternal laser beams that can't seem to aim where he's looking have been cut drastically, he's dead before they even start warming up. - Lois's benediction of Superman is removed (the Flash must have given her a lift to the station, she arrives so quickly, but then, Zod's eye beams did go on for a while...). 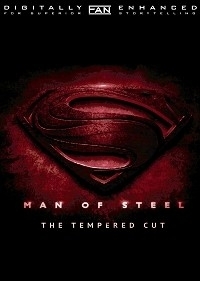 - The Tempered Cut added to the Man Of Steel title page. - Fanedit by DSM2337 added to Editor's credit page. The narrative from DSM2337's perspective to watch Superman in a chronological order to get a sense of how Clark develops is interesting. The progression and trims of unnecessary developments in the film are really good. I am a huge Superman fan and this perspective is very interesting, although I really prefer the flashback view of it. The visual editing is really good and the initial edit of the movie making it all about the music with a natural and classic way of showing Krypton and Clark's parents was great. Definitely a must watch. 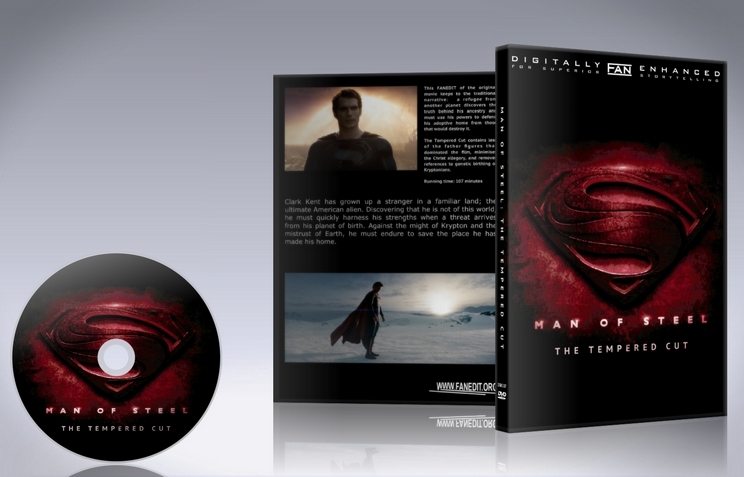 All around, the best edit of Man of Steel I've seen so far. All the heavy handed "you're the only savior of humanity/Jesus complex" crap has been cut, making it a far better film than the original. I don't want to ruin anyone's experience and while the order of the cuts took me by surprise at first, it flowed much better than anything I've watched to date. Only issue was the audio quality, which may just have something to do with the fact I watched the lower res DVD version. In any event, I highly recommend watching it. Good stuff. I have to congratulate DSM2337 on his efforts with this edit. MoS has a lot of problems and DSM2337 does a good job of using what is available to straighten the story out. The cuts work very well and nothing that has been cut was something I missed. It just flows much better and more naturally. I watched the medium quality version, the video looked great but the audio quality was a little lacking. Probably not something that is an issue in the high quality version. I was not a fan of the theatrical cut of Man of Steel. It was bloated, pretentious, and I felt nothing for any of the characters. DSM2337 does a nice job of reigning in this not-so-great film making it quite enjoyable. All the cuts are seamless save for two audio edits. I doubt very much the layman viewer will notice but more seasoned fanedit watchers and/or faneditors might pick up on them. It's possible this is the best that could be done with the source. It's not too distracting and doesn't hurt the enjoyment of this fanedit. The picture and audio quality are fantastic. I didn't notice any artifacts or other problems. 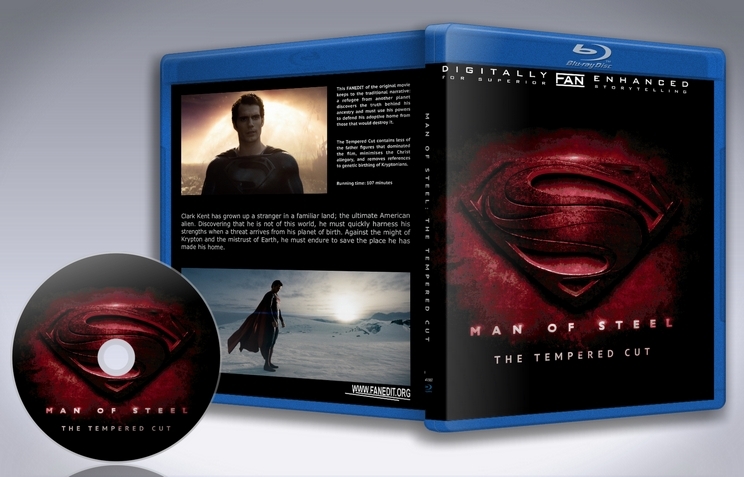 If you want to see what Man of Steel should have been definitely check out this edit. Its well paced, never dull, and helps focus the story. I can't wait to see what DSM2337 does next.